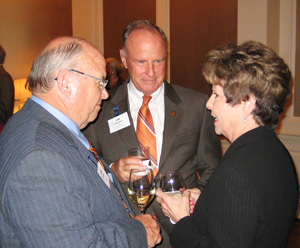 SHSU President Jim Gaertner, center, visits with former SHSU regent James A. Hayley and his wife, Jane, at one of three Share the Vision dinners. Sam Houston State University and its first-ever capital campaign are doing well. That was the message from Jim Gaertner, SHSU president, in three "Share the Vision" dinners for more than 400 donors and potential donors at three Houston area locations recently. Gaertner said that less than halfway through the five-year campaign, which has a goal of $50 million, $38 million has been raised in gifts and pledges. "I'd like to see us break through that goal and surpass it by a significant amount," he said, citing figures from other universities that had conducted their first capital campaigns. These include Stephen F. Austin (27 percent more than $30 million goal), Texas State (3 percent more than $69 million goal) and Tarleton State (7.5 percent more than $40 million goal). Gaertner said that SHSU is doing well by almost any measure, listing a number of national awards and recognitions for various programs and individual faculty. The proof of quality is an enrollment increase of 22 percent over the past five years, which has made it a growth leader among public colleges and universities. "Not only are we attracting more students, but we are attracting better students," Gaertner said. Latest available figures for SAT scores of incoming students show that SHSU stands at 1032, which is higher than the Texas (997) and national (1021) averages. While enrollment has increased, he said, the university has worked hard to maintain a low faculty/student ratio. The current ratio is 1:20, which is comparable to when 110 students enrolled in the first classes at Sam Houston Normal Institute in 1879. More than half of SHSU's graduates are the first in their immediate family to obtain a degree, about 68 percent of them receive some form of financial assistance and 80 percent of them work. The reason for the capital campaign relates to that profile, Gaertner said, and giving more students the opportunity to complete a college education. Recently announced tuition increases at SHSU and other universities underscore a change in philosophy when it comes to legislative appropriations. The Texas legislature has gone from regarding a college degree as a "common good," he said, to considering it as a "private right," with students paying more and more of the costs and universities being forced to increase tuition and fees. Sam Houston State University now receives about a third of its budget from state appropriations, he said, when two decades or so ago the figure was about 70 percent. "It is important that no student be denied the SHSU experience due to lack of financial resources," Gaertner told those attending the dinners. He outlined the campaign's priorities as $10 million for student scholarships, $18 million for faculty and staff endowment, $14 million for new degree programs, $5.25 million for construction projects, and $2.75 million for other campus projects. In addition to Gaertner, speakers included campaign leaders Ron Koska, Don Sanders and National Chairman Ron Mafrige. Additional information on the Share the Vision campaign is available online.